This was not how it was supposed to go when Doc Rivers was traded from the Boston Celtics to coach the Los Angeles Clippers in 2013. The Red Sox won the World Series. The Cubs won the World Series. It’s 2017 and sports curses are not supposed to exist anymore. And yet, the Clippers, despite their attempts to change their image and their fortunes this decade, remain thoroughly and actually cursed. Winning the Blake Griffin lottery should have helped them. Moving on from longtime GM Elgin Baylor, one of the NBA’s greatest players and one of the most unlucky NBA lifers, should have helped them. Vetoing a trade that would have sent Chris Paul to the Lakers and instead forcing the New Orleans Hornets to deal him to the Clippers, as former commissioner David Stern did, should have helped them. Banning longtime cheapskate owner and genuinely horrible human being Donald Sterling from the NBA, as current commissioner Adam Silver did, should have helped them. 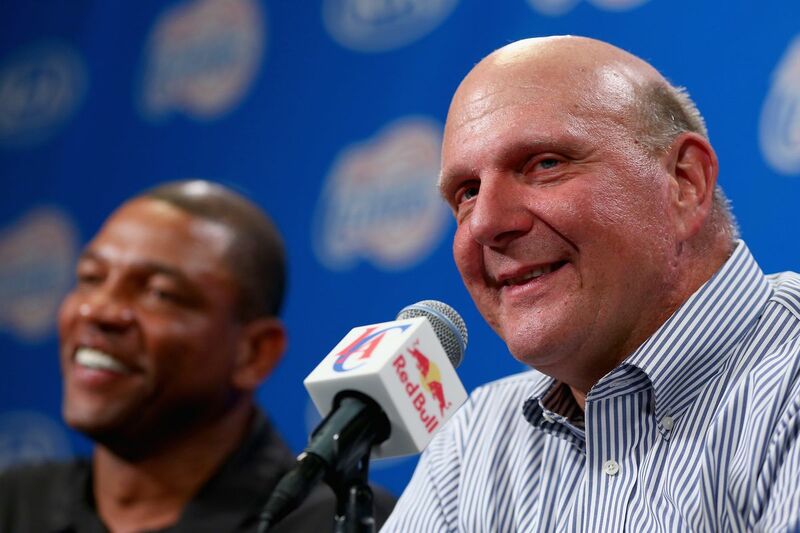 Sterling selling the team to a smart and energetic guy like former Microsoft CEO Steve Ballmer should have helped them. Managing to re-sign DeAndre Jordan, even after he made a verbal commitment to the Dallas Mavericks, should have helped them. In the 2010s, the Clippers caught more breaks than they did in the previous 30 years, and they still could not advance beyond the second round of the playoffs. It also made sense to move on from Chris Paul this summer. The mix of current star players could not get it done in the playoffs, and Blake was the younger of the two. By trading Paul, I thought it opened things up to do more things, and run the offense through Griffin. I did not think the Chris Paul Trade was a clear and obvious win for the Houston Rockets–even though they landed the best player–because the Clippers got Patrick Beverley coming back the other way. I thought this year’s Clipper team had a real chance to improve. Even if their regular season record did not improve, the new look Clips had potential to advance farther in the playoffs if things broke the right way. The Clippers blew their best chance in the second round of the 2015 NBA Playoffs against the Houston Rockets. They could have closed out the series in the sixth game, and were in control of things when the Rockets made an improbably comeback with James Harden sitting on the bench and Josh Smith hitting shot after shot. That was one of the most bizarre turns of events in recent basketball history, and even though they probably would have lost to the eventual champion Warriors in the Western Conference Finals, we will never know since they did not get there. The Clippers are currently 6-11 on the 2017-18 season and have won one of their last ten games. Patrick Beverley is now out for the season with a knee injury. Free agent acquisition Danilo Gallinari is also currently out with injury. Blake Griffin has been healthy to this point, but to this point in his career, you can also pencil him into the injury report every season. While it is true that you cannot win it all in October and November, it is possible to kill your season in these early months. The Clippers are digging themselves a deep hole in a competitive conference. As a Celtics fan, I was sad to see Doc Rivers go when he left. He coached the best era of Celtics basketball in my lifetime to that point, and prior to Doc, the most famous Celtics head coach since I started following the NBA was Rick Pitino, whose tenure ended badly, and I have been rooting against ever since. Doc did not want to be around for a another Celtics rebuild, when it was clear that was the direction they were going, and the Clippers opportunity was one that also gave him more roster control. It made since for him, and with the Celtics years away from contending again, I was ready to root for the Clips in the West. Unfortunately for Doc, he had the misfortune of being replaced in Boston by Brad Stevens. Stevens took Butler University to back-to-back NCAA National Championship Games, went toe-to-toe with the greatest powerhouses in college basketball despite far less recruiting power, and has improved the Celtics every year since he took over on the sideline. In 2017, Stevens’ Celtics advanced father than Rivers’ Clippers ever have, and they currently have the NBA’s best record. The Celtics completed their rebuild, but the Clippers look like they are headed for the kind of growing pains Rivers was trying to avoid when he left Boston. As it is, he is without Chris Paul, without Beverley and Gallinari, and having to rely on his son Austin (who is not very good at basketball) to play significant minutes, while Jerry West has been brought in to run the front office for him. This cannot be the nature of the gig he signed up for, but that is the NBA. What is most crazy about the Clippers’ predicament is that the Chris Paul and Blake Griffin years have been some of the most successful in the history of the franchise. They had great players, they hired a good coach, they upgraded from maybe the worst owner in professional sports to a smart and enthusiastic (even if inexperienced) one, and they still could not get out of the second round. The more I think about it, the more the only explanation is that makes any sense is that the Los Angeles Clippers are truly and woefully cursed. That has to be it.